The view from near the back of the lawn. 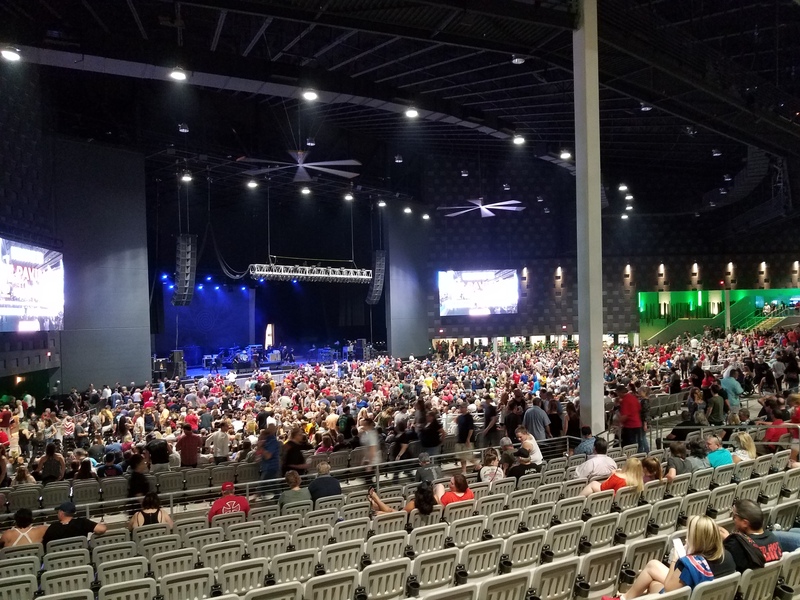 The new Pavilion music venue is still working through some opening hiccups, but it has potential to be the best suburban venue of its kind in North Texas. The Pavilion at Toyota Music Factory, née the Irving Music Factory, still feels like a work in progress. 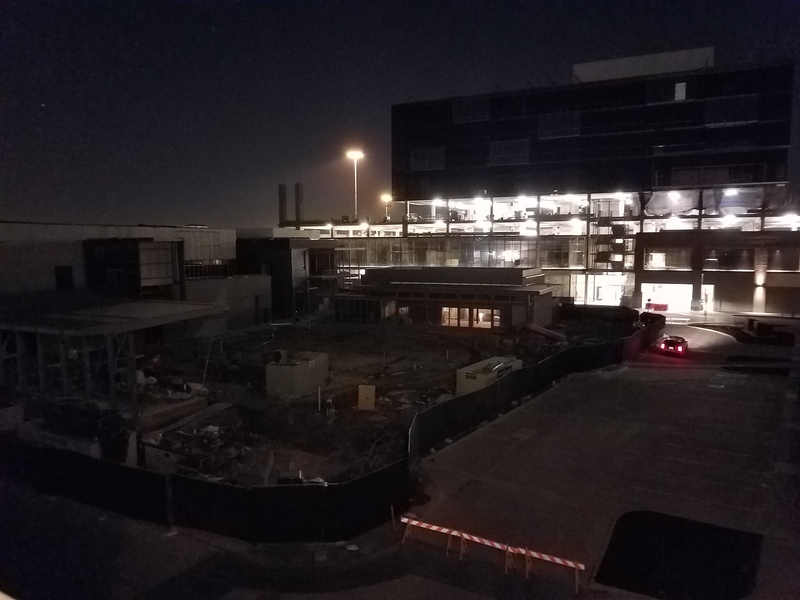 The Live Nation venue remains surrounded by an eyesore sea of construction, the first of more than 20 restaurants and bars planned for the Las Colinas entertainment development opening its doors just this week. Parts of the Pavilion itself, which debuted last weekend after a last-minute delay, look unfinished. A driver unfamiliar with the area, one whose navigation skills are admittedly lacking, may find the scattered parking lots and somewhat poorly marked signs unwelcoming. But at Thursday night’s Sammy Hagar concert at the Music Factory, it was easy to see how the venue could turn into something Irving could be proud of, even if I’m pretty sure I heard the 69-year-old Red Rocker thanking “Dallas.” A curse Mid-Cities venues will always have to bear. The convertible Pavilion comes in three shapes: cozy indoor theater, slightly bigger indoor theater, and an indoor-outdoor amphitheater seating 8,000 fans. On Thursday we got the big one, an inclined lawn with a view of the sky, office towers, and the nearby highway, grass sloping down toward the covered seating and the stage. It’s a configuration that will ring a bell for anyone who’s seen a show at Starplex Pavilion, Live Nation’s summer concert center at Fair Park. The Music Factory venue is smaller, and more smartly designed. Bars and concessions are within pebble-throwing distance wherever you stand, including the top of the lawn. Prices are about what you’d expect at this kind of thing: $4 for a 12 oz. Bud Lite, $6 for a hot dog. Bottles of wine, presumably for more refined indoor theater nights, and craft beer are also on sale. Blankets and seats are up for rent, but I had no problem squatting on the grass. The stage is visible from throughout the Pavilion’s spread, including the nosebleeds, and while the sound won’t blow away any audiophiles, it was loud enough for the Hagar heads in the back. In fact, after taking one of the cramped fold-out chairs on the floor for a spin, I decided I was better off on the cheap-seat grass. Easier on my backside, and less chance of a sweaty elbow jutting out of a Van Halen T-shirt and jabbing me in the gut. 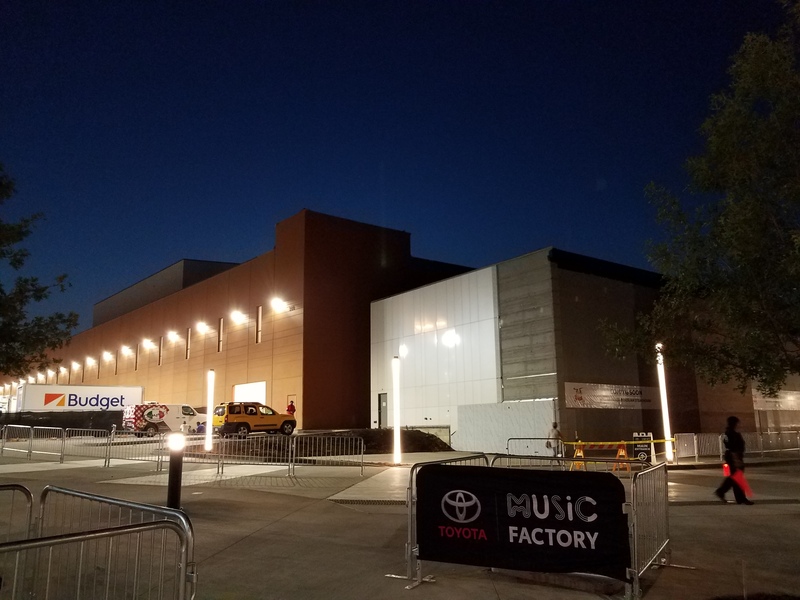 I didn’t encounter any of the plumbing issues reported on the Music Factory’s opening night last week — the place mostly smelled all right — but the lines for the men’s rooms were painfully long in between the opener’s set and Hagar’s opening riffs. This was not the case for the women’s rooms, although that may be more a reflection of Hagar’s audience. Bar lines were short. Maybe there are some correlations here, I don’t know. The concourse lighting is moody during shows, bright in between. I also had no problem with traffic in or out, although I did have to make a bit of a hike from the Williams Tower parking garage, about a half-mile from the Music Factory. Full disclosure, I arrived a bit late and left a bit early. Your experience may vary, but there is parking at the nearby Irving Convention Center, as well as a DART orange line stop not far away. The valet stand and Uber drop-off were very visible right in front of the building. 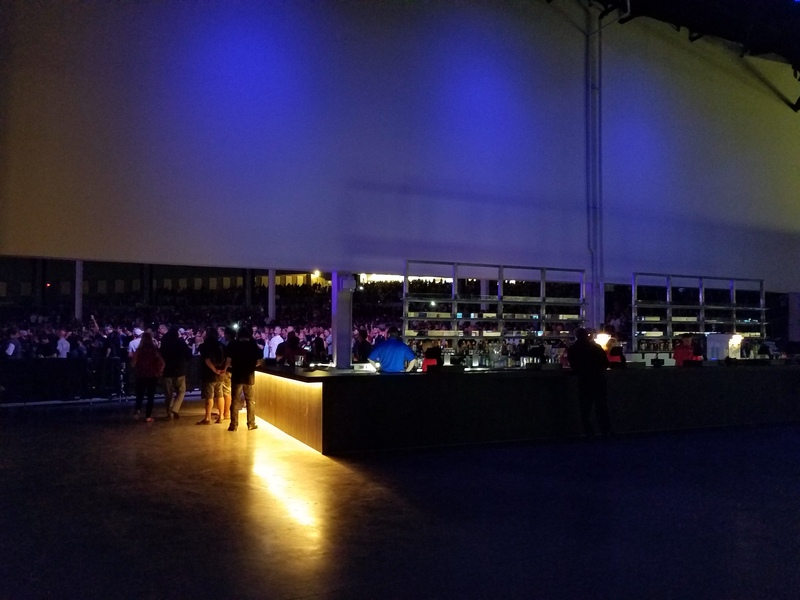 The Pavilion’s convertibility is nifty, and I spent some time rubbernecking at the big steel doors pulled up on Thursday evening to open the lawn. It’s impressive to think that both Sammy Hagar and Hillary Clinton, who is speaking on the stage in November, could fit right in at this Irving concert venue. But there’s nothing particularly revolutionary or inspiring about the Pavilion. That’s fine. It improves, in small ways, on venues like Starplex and Verizon Theatre in Grand Prairie. It’s more comfortable and more temperate than the former, and will (eventually) be surrounded by more worthwhile bars and restaurants in the case of the latter. Once those bars and restaurants and the Alamo Drafthouse movie theater open, that should actually be one of the Pavilion’s bigger draws. A movie-drinks-dinner-concert sequence, all within the same mega-development, has its appeal. Much of the area surrounding the Pavilion is very much still under construction. Dallas-dwellers who would prefer to do that in, say, Deep Ellum, may groan when their favorite band gets booked at the Music Factory. And, like it or not, some of your favorite bands will get booked at the Music Factory. Learn to live with it. Wherever you call home, the Pavilion has potential to be the best suburban venue of its kind in North Texas, an extended amusement park trip that will lock you in and keep you amused until the ride is over. It’s not quite there yet, and I’m left with the impression that this project could have benefitted from another month or two of under-wraps work. Opening hiccups have to get ironed out somehow, though, and I’d expect the Music Factory to be an efficiently-operated entertainment machine by the end of the year. Meanwhile, those upcoming shows from KISS, Wilco, and Dave Chappelle will be right at home. As for Hagar, the old guy’s still got it, and you can never do too many Led Zeppelin covers. It does kind of look like a factory.